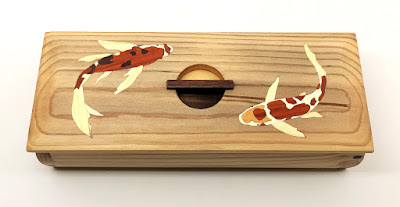 Beautiful Natural Wood Inlay in Flora & Fauna Motifs. Celebrating Amazing Color & Grain with Craftsmanship. The irony of beautiful, natural wood grain is that you have to cut into the tree to see its one-of-a-kind patterning. Wood may seem commonplace, but it's a crucial resource that should be used with care. 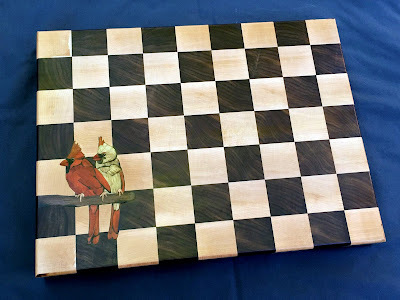 Thank goodness for artists like Matt Kressin of Sawtooth Designs who do a wonderful job celebrating this gift of Mother Nature with skillful woodworking and craftsmanship. At the core of Sawtooth Designs is sustainability with ethically sourced materials and a low waste artistic process. Their appreciation for wood shines through in the array of colors and grains used to create each decorated, but also durable home good. Matt currently offers a variety of cutting boards, trays and boxes. 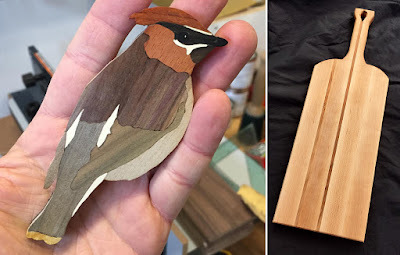 He creatively combines wood tones to create different designs, from flora to fauna. The real challenge with wooden inlay comes in piecing together the motif like a puzzle and having all elements fit like a glove. All of Matt's pieces come out of his workshop smooth and like the pattern was left in the wood by nature! I'm sure his process is amazing to watch. Matt also welcomes custom orders for the challenge of making designs others dream up. Sawtooth Designs embodies what you'd hope for every artist using natural elements, bringing out the beauty!